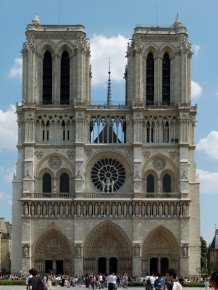 French government to sell off Notre Dame in Paris ! We know that the French government, desperately in need of money, is selling off whatever it can. After the Hôtel de la Marine, it was obvious that this full-scale garage sale was not going to end there. The current economic crisis has only speeded things up. Now, one of France’s most emblematic monuments will be turned over to a private firm which, according to our sources, would be a leading hotel chain. This company apparently has big plans in the works : the idea is to install, in the very heart of this prestigious building, a water sports centre around a large swimming pool to be dug right in the middle “with complete respect for the Gothic architecture which, let there be no doubt, will not be defaced” as indicated to us by the Chief architect for monuments historiques. Let us remember that these paintings were commissioned in the 17th century every year from the best artists by the confederation of silversmiths for the cathedral. Previous article in Heritage : Hôtel de la Marine : will France go to the highest bidder ?